Stories about the illegal ivory trade and the visit a group of conservationists made to an “ivory room” where confiscated elephant tusks are stored. Coming upon the carcass of a poached elephant I have known and followed for 20 or 30 years is the hardest part of being an elephant researcher. It is the immensity of that individual’s death that is so distressing. He or she had a rich, complex life with family and friends. It involved growing up and all that learning that elephants have to do—where to go, what to feed on, where the water is, how to interact with other elephants, who and what is dangerous—all passed down from matriarch to matriarch and from them to the family members. With each death a bit of knowledge and experience is lost. For me each death is a failure on my part to protect that individual from the hand of man. That is the pain I feel when an elephant is killed and it never diminishes. An unremarkable small office. Within, a padlocked metal door. But behind that door, in the shadows… the tusks of the fallen, piled high. Hundreds of them. Mass graves come to mind, and worse. Hundreds of elephants that once roamed the plains, their lives abruptly truncated, reduced to this, these discarded lives, this All That Remains. The purpose of our visit was for me to choose, for a photo shoot that I was planning, the biggest tusks of elephants killed at the hands of man. A number of rangers from Big Life Foundation – whose job it is to help protect the ecosystem here – would hold the tusks of the fallen. 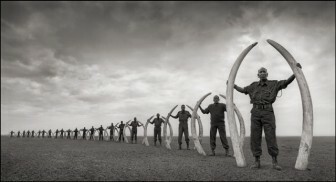 A couple of weeks later, on Amboseli’s lake bed, those tusks were brought back to the land where those elephants once walked in large herds with their brethren, on their daily journey to and from water. These rangers are part of the army of men determined to ensure that their kin can continue that journey in the years to come. The visual impact of piles of tusks, stacked one atop the other, the smaller ones in cardboard boxes – marked with blue and red and black, letters and numbers that seem to try and sanitize the story in a way, but of course cannot. To look at a single piece of ivory – run a finger along its smooth surface, feel its weight – can, if you’re not careful, be seductive. But not in an ivory room. Not en masse. To see the inanimate remains of such an emotionally complex animal begs the question, Are we not emotionally complex? Surely we can do much better than this. Seeing piles of ivory stacked in an ivory rooms triggers all sorts of emotions: wonder at nature’s never-ending ability to create something so beautiful, then the wish to be able to know the stories that the individual tusks could tell of the lives the elephants that carried them. From there, anger kicks in when I realize that most of the elephants that carried this ivory have had their lives cut short at the hand of man. Maybe it was from the slow lingering death of a poisoned arrow, or a festering snare wound, or a bullet from an irate farmer for the elephant’s sin of taking food from a farm set on land which the was once the feeding ground of its forefathers. Then more anger and sadness sets in. I think of the probable final destination of the tusks, probably to be turned into a trinket to satisfy the whim of someone thousands of miles away, who has no idea, or couldn’t care, that by buying it, they have sentenced another elephant to death.